Connecting to streaming and download services allows our platform to retrieve your catalog metadata and synchronize your sales reports and daily playback trends. It also allows for more convenient, streamlined distribution. Connecting DSPs that currently host your assets is the quickest way to get started and get the most out of Revelator. Note: To connect with iTunes, you must have a direct deal with iTunes and know your iTunes Connect vendor ID, email and password. No need to worry, your data is safe, we can only read data from iTunes, and we can never overwrite any of your data on iTunes without your permission. From the Main menu, click Services. Select the service you would like to connect to using your existing account information. You may filter the available services you are viewing by clicking Distribution, Reporting, Payment, or All on the left side of the page. 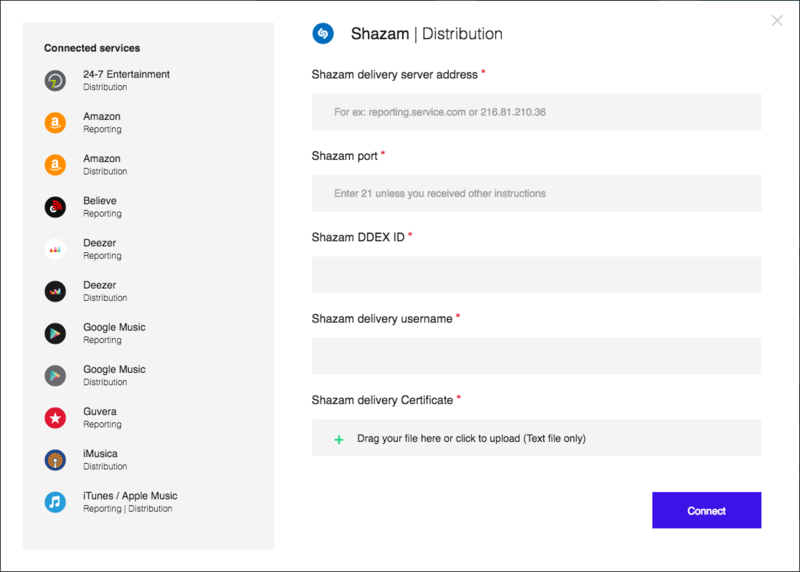 Enter the delivery server, your DDEX ID, username and delivery certificate for Distribution. Enter your account information including host server and port address for Reporting services. Click Connect to link your account. Select each subsequent service you would like to connect, and enter the relevant information for each accordingly.